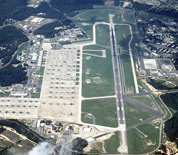 Pope Army Airfield, also known as Pope AFB, is located in Cumberland County, North Carolina just outside of Fayetteville. Although many Air Force units conduct operations out of Pope, the Army's Fort Bragg is responsible as the base host unit. The 43rd Airlift Group, the 18th Air Support Operations Group, the 427th Special Operations Squadron and the 21st and 24th Special Tactics Squadrons are based at Pope. The Air Force Combat Control School also functions from base. Additionally the 440th Airlift Wing of the Air Force reserve performs airfield operations. In 2011, Pope AFB became Pope Field and combined with Fort Bragg. This Pope Army Airfield (Pope AFB) directory features the critical info you’ll need to navigate through the many facilities and recreational opportunities available on base.